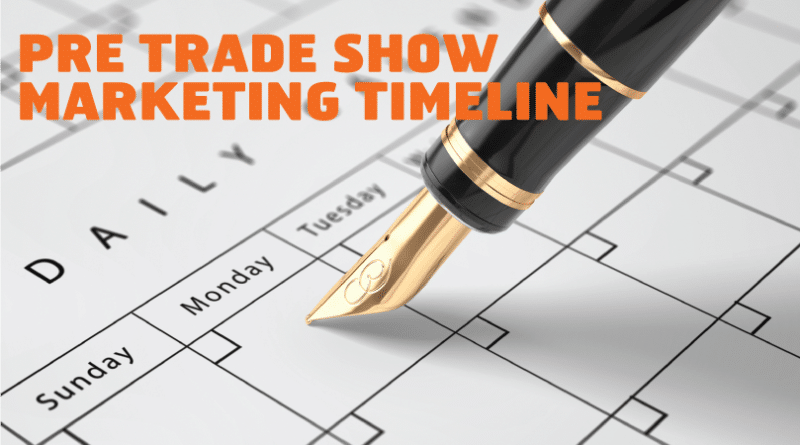 Just when should you begin your Trade Show marketing strategy? Follow these marketing tips to ensure adequate and plentiful attendance at your trade show booth! Set your objectives and goals for this specific show. What do you want to achieve sales wise and how will you measure those metrics? Without a concrete way to measure ROI you will be exhibiting blind before and after. Announce your presence at the show. Utilize your email list, website, and social media to create a ‘Save the Date’ for your followers and clients. Some bigger shows may have your booth number already established. Be sure to use that booth number in ALL pre-show marketing. Review sponsorship opportunities’ from the show and factor these into your pre-show announcements as well. Begin the early process of vetting your leads. Begin determining the key people you would want to use your free passes or budget on for attending. Think buying power. Set your trade show marketing objectives. Begin sending out formal invitations to your invited guests. Figure out a system, whether physically or electronically for tracking their attendance. ‘Snail Mail’ now gives a more personalized message to the recipient. Send a physical invite to your top prospects and ensure you use high quality paper products only. Carry on your virtual invitations online via E-mail and social media. Create a custom URL using platforms such as Bitly that allows you to track who clicked on the link! Make sure all links land on a dedicated landing page that includes registration options and your complete exhibit information. External links to the show itself and supporting contractors can also be helpful. Regardless of how you create you’re landing page, stick with it through post show follow up. Slowly begin increasing your social awareness to the conference or trade show. Find out the show’s official hashtag and begin Tweeting around it. Plan blog posts on LinkedIn and short form posts on Facebook and Instagram showcasing your presence at the show. At this stage, aim for at least three times a week on Twitter, Facebook and Instagram. Begin sorting through your RSVP’s and calling them. Set up appointment times where you can meet with them face to face at the show. Some companies set up over 1500 appointments before the show opens! Continue your strong social media push with teasers, behind the scenes photos, and all around hype. If desired, begin a pre-show contest that includes giveaways. You can design your contests in a variety of ways such as raffles, social media mentions, or quizzes. Don’t be afraid to use the show destination in these either! Curate the majority of your social push to the show. There are no limits with what you can create at this stage, but be sure to continue directing traffic to that landing page. Announce any pre-show buzz, product launch teasers, or company news at least five days before the show! Showtime is over saturated with information; this allows your audience to focus in on your company’s strides and creates additional buzz for your exhibit. Send a reminder E-mail to ALL RSVP’s at least three days before the show to further confirm their attendance or appointment time. Changes will occur, so don’t fear a few cancellations or time changes. Engaging your trade show attendee’s. Live tweet your show across your social channels using appropriately timed postings. Designate a person on your sales staff JUST for social media. Respond to any social interactions (Positive and Negative) to ensure transparency. Film and take numerous photos! The activity on your booth this year can be used for your pre-show marketing campaigns for the following year. Thank all of your attendees and appointments for attending, and remind them to check the landing page after for show coverage and information. 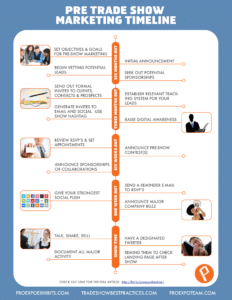 Sticking to these milestones will ensure your booth attendance and buzz remains strong! Download our FREE & convenient timeline so you never have to guess again!